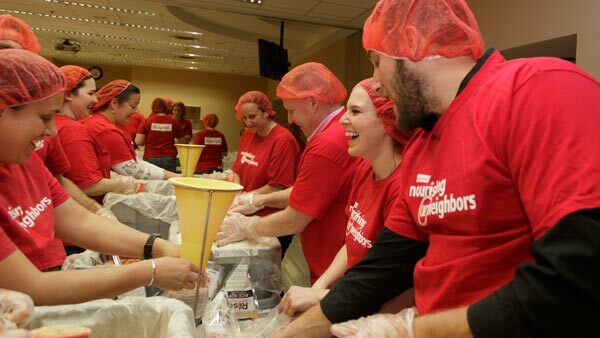 CAMDEN (WPVI) -- Camden-based Campbell Soup Company hosted its annual week of service called Make a Difference Week. Approximately 3,800 employees volunteered in 70 community projects in Camden, and in 17 of the company's other U.S. locations. Make a Difference Week projects are focused on building and sustaining healthy communities where Campbell has operations. Campbell Soup Company employee volunteers join forces at Specca farms to glean spinach and leeks that will be later donated to area churches and nonprofits. As part of the week of service, Campbell employees rallied together to volunteer alongside more than 20 organizations, such as Rise Against Hunger, New Jersey Farmers Against Hunger and more. In recognition of the 4,000 hours that were volunteered during the week, the Campbell Soup Foundation will also distribute approximately $60,000 in grants to nonprofit organizations where Campbell employees volunteer.